Keshav and Jaya are from two villages near Mathura where at least 80% of households have no access to lavatories. Conflict comes knocking on the first day of their marriage, when Jaya discovers that Keshav's home has no toilet and she leaves. Distraught and desperate, Keshav embarks on a mission to win back his love by battling against the age-old traditions, mindset, and value system of his country. More details of Toilet -Ek Prem Katha on wikipedia. Original Toilet -Ek Prem Katha Blu-ray released by Big Music comes in 1 disk Blu-ray pack. Blu-ray having 3 Subtitle. While processing the order, we bubble wrap the Blu-ray in its original packing and send it in sealed plastic or carton pack. We don't offer download of the Movie Toilet -Ek Prem Katha, nor we send free poster of the Movie along with its Blu-ray order. We also don't offer free wallpaper or song download of the Movie. Poster and other accessories of the Movie can be purchased separately. Buy Hindi Blu-ray Toilet -Ek Prem Katha and watch them at the comfort Of your own home. Online shopping Toilet -Ek Prem Katha Blu-ray, Buy Toilet -Ek Prem Katha Blu-ray, purchase original Hindi Blu-ray of Toilet -Ek Prem Katha. 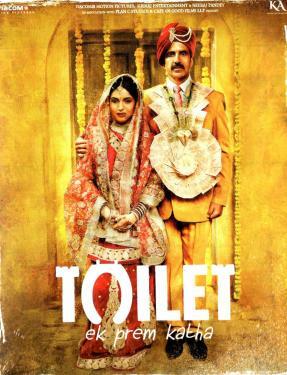 Online store to buy Toilet -Ek Prem Katha Blu-ray	, online Blu-ray store india, buy Hindi Blu-ray, watch Hindi movie Toilet -Ek Prem Katha videos online. We don't offer Blu-ray renting for Hindi movies online, Buy Original Toilet -Ek Prem Katha Blu-ray @ discounted and cheapest price online in India.